"A great Passover treat! 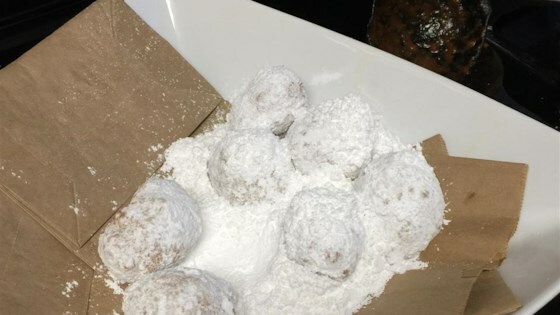 Doughnut like balls made of matzo meal are fried to perfection. Dipped in sugar, they are a treat you are sure to enjoy year round!" In a large bowl, whisk together the eggs, water and salt. Add the matzo meal and whisk until smooth. Cover and refrigerate for at least 30 minutes. Heat the oil in a large heavy skillet over medium-high heat. Once the oil is hot, drop rounded teaspoonfuls of dough carefully into the oil and cook until golden brown on both sides. Drain briefly on paper towels, then toss in sugar while still warm. These sweet, crispy treats are more fun than a turn on the Tilt-A-Whirl. SO glad I found this recipe I had a few boxes of matzo meal that I wanted to use up .They are great and very easy . I will make these again when I'm in the mood for something ,warm,soft & sweet.